For a lifetime of healthy teeth and gums, it takes a lifetime of personal and professional care. Starting your child’s daily hygiene with the first tooth eruption is a must; but you should also consider beginning regular dental visits in their early years, around or before their first birthday. There’s evidence that early dental visits hold a number of benefits that could lead to reduced oral care costs over their lifetime. Familiarity with professional dental care. Children need to feel comfortable and safe in their surroundings, especially new places. Beginning dental visits early improves the chances your child will view the dentist’s office as a regular part of their life. It’s especially helpful if the dental professional has training and experience with young children to put them at ease. Early monitoring for dental disease or other problems. A young child’s teeth are highly susceptible to tooth decay. 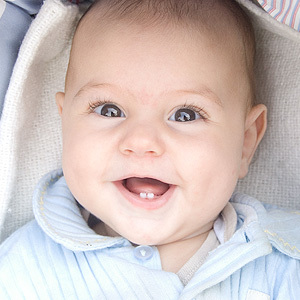 Dental visits that begin early in a child’s life increase our chances of detecting any developing dental problems early. In addition to treating decayed teeth, your child may also need preventative actions like sealants or additional fluoride applications to protect teeth if they are at a higher risk for disease. As the child develops, we may also be able to catch early bite problems: with interventional treatment, it may be possible to reduce future orthodontic costs. Parental help and support. As we discuss your child’s dental care with you, we’ll be able to provide essential information and training for how to care for their teeth and gums at home. We’ll also be able to ease any common concerns you may have, such as thumb sucking or other oral habits, as well as give you sound advice and techniques for dealing with these problems. As with other areas of childhood development, starting off on the right foot with oral care can make all the difference to their future dental health. The sooner you begin regular dental visits with your toddler, the better their chances for a lifetime of healthy teeth and gums. Are Crowns Right for You? Bad Breath! What Could be the Cause?